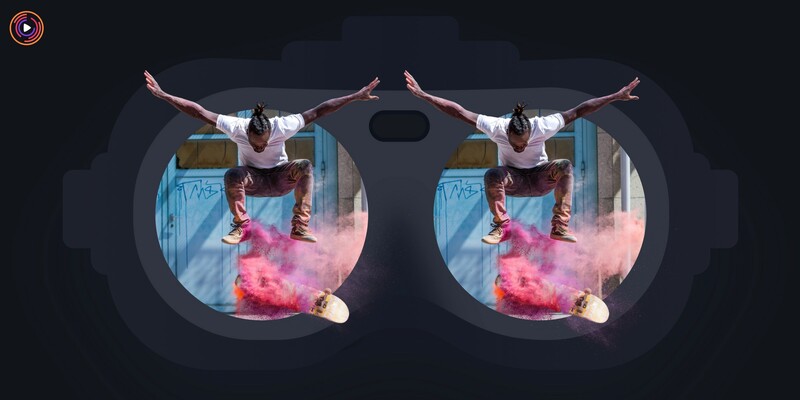 Why Does Stereoscopic Video Matter in VR? Most humans perceive the world through two eyes. Since our eyes point forward it unfortunately leaves everything behind us out of sight. Our eyes coordinate to provide a three-dimensional representation of what is before us. We call this mechanism stereoscopic vision. One of the most significant problems that came with the development of virtual reality (VR) technology is motion sickness. VR motion sickness occurs when our eyes tell us something is happening around us, but our body reports different movements, that do not correspond with what we see. We see movement but feel something different. This disconnect between what we see and what we feel causes inner confusion that manifests itself in symptoms like nausea, dizziness, sweating, headaches, and excessive salivating. Moreover, these symptoms may persist or even compound for hours after a VR experience. It was discovered that VR motion sickness can often result from how a VR video was recorded. If it was not recorded with stereoscopic technology, mimicking our own natural eyesight, it can cause us significant problems, as outlined above. What is Stereoscopic Video Imaging? Stereoscopic imaging is a technique used to give flat images a three-dimensional effect. This adds necessary depth and creates a more natural viewing experience to what would otherwise be dull, static images. Our eyes do this for us naturally in a normal viewing environment. Display each image separately and use active shutter glasses to filter the image so that the correct eye sees it. Present both images superimposed with each other and rely on polarized glasses to combine both images. Present each image directly into each eye by using a parallax barrier on the screen that makes use of the difference in the position of the eyes. The barrier allows one eye to see a different set of images than the other eye because of the slight difference in angle of the eyes. Whether you are a producer of content or a consumer, you should have an understanding of this to make the overall VR experience easier. Utilizing stereoscopic recording when creating VR content will result in a higher quality product and an overall superior consumer experience. A stereoscopic camera recreates what normal human eyes see. Our eyes are positioned approximately two and a half inches apart, and this leads to different perspectives of what the eyes see and a different interpretation by the brain. Stereoscopic cameras record two images from slightly different angles and then combine them into one. Most stereoscopic cameras are fitted with two lenses to make it possible to capture images from two slightly different perspectives. With the use of advanced image processing techniques, the images are then merged together, in a process called stitching, to form a 3D, or VR, viewing experience. Recorded stereoscopic video is typically stitched together to form a seamless viewing experience by using separate stitching or encoding devices and software. When VR video is recorded and processed in this way, it provides a viewing experience that closely resembles what we experience naturally with our own eyes. Such a natural viewing experience greatly reduces or even eliminates VR motion sickness. Perhaps the most innovative VR camera available is Live Planet’s new Stereoscopic, Natural VR™ Camera, which is designed to capture video at the same interpupillary distance of 95% of the world’s population. This camera can produce what Live Planet calls Natural VR™ — stereoscopic VR delivered the way we naturally and comfortably see the world. The Natural VR™ camera from Live Planet also features onboard, real-time stitching with built-in WiFi and Ethernet, enabling users to record, produce, and stream VR video from virtually any location. Your video is recorded, processed, and uploaded to the cloud, where it can be stored or streamed according to your desires. For more information about stereoscopic video in VR, cloud video storage, or stereoscopic cameras, contact Live Planet. The Live Planet Stereoscopic 360 degree VR System provides an all in one VR experience in one shockingly small package.